Add gift wrap to this item for $2.75. The adoption blocks were our inspiration for our greatest event ever! We were asked to convert our baby block over for friends who had internationally adopted. We made the block, put it on the website and noticed quite of few babies were coming to the US from China! We chatted with customers about their experience and VOLA we were submitting our paperwork to meet our daughter. In a whirlwind of events Miss LeeLoo came home about a year and a half later! The new version has the birth stats for those that are adopting domestically and it is very similar to our standard Typeface baby block. If the stats are unknown we will put a teddy bear image on that side. Personalized gift for adopted children, domestic or international. One all natural maple block - 2 inch cube. Great gift for parents, grandparents, and great grandparents. 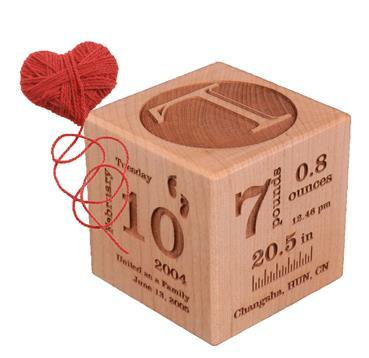 Each adoption block is laser engraved with the details of the child's adoption. Engraved details include: Child's full name, date of birth, time of birth, weight and length, name of parents, date of adoption and where they were adopted from. We know that international adoptions might not have the stats thus we can engrave a teddy bear image on the stats side when unknown. Optional Engraving includes: name of siblings, and name of gift giver. Adoption Block is handcrafted in Mooresville, Indiana USA.